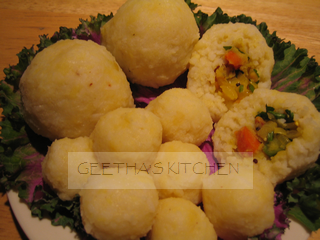 I fondly remember that Amma used to make little rice balls with dal and veggies for us when we were little children. This is a tradition in South India since time immemorial and continues to this day and are called 'muddhas' or kisses in some parts of the south - how apt! Japanese Onigiri remind me of these little rice balls. Mothers make little balls of food for their darling toddlers to not only lovingly tempt their mercurial appetites but also because little ones love to be independent (the universal "I do it" stage) - they love to pick up tiny morsels using their fingers and feed themselves. We neither had special names for them nor made them as a dish in their own right - until now! Thinking of rice balls brings back another lovely memory: One of the elder ladies (typically a grandmother or an aunt) would gather all the young children (sometimes even the not-so-young :D) for supper. The children sat in a semi-circle and the keeper of the rice pot handed each one a little rice ball just perfect for one mouthful. We made a little indentation with our thumbs so that a little spoonful of the various curries or some pickles could be placed in them. And then came the best part; the whole thing went down the hatch! Seeing others try and relish various delicacies encouraged all the children to try everything. Somehow the food tasted better and in no time at all, everyone was well-fed. I am thrilled to discover onigiri or Japanese rice balls! Onigiri (they look like Sumo wrestlers with the little wrap of the seaweed, nori) are seasoned rice balls with a filling. When I came across onigiri, I could see that the possibilities are just endless. Just as a trial, I made them with brown rice, dal, and cauliflower upperi. Then I made them with Basmati rice and other dry vegetable curries too! Bored with sandwiches, wraps, etc, Keeshu is quite delighted with this new prospect for lunch! Muddhas may be eaten warm or cool, plain or toasted. Wash the rice in a couple of changes of fresh water and drain in a fine strainer. Place the rice in a bowl and cover with 2 cups of fresh water. Cover and let soak for 1 hour. Drain the rice, place in a pan with slightly less than 2 cups of water (about 1+3/4 cups). Bring to a boil, turn heat down to simmer and cook for about 15 minutes. Cover and let sit for about 10 minutes. If using brown rice, cook and let rest covered for 20 minutes. I cooked the rice in the pressure cooker (used twice as much time as white rice) and it came out perfectly plump and delicious. Let cool slightly. You can make muddhas with plain rice, dal rice with your favorite dal, or chutney rice with any chutney such as Red Bell Pepper Chutney. For dal or chutney rice, mix the hot rice with thick dal/chutney and let cool until cool enough to handle comfortably. For large muddhas, use a small bowl which measures about 1/2 cup and for smaller ones, use a smaller bowl; Indian katoris come in various sizes and work very well. Rice muddhas work easier if you use cling wrap to form them into balls. Take a piece of cling wrap to line the bowl; it should be large enough to hang outside the bowl. Scoop about 1/4 cup of the warm rice into the bowl and lightly press down; add a little of the chutney/pickles and a tablespoon of the cauliflower upperi on top; add another 1/4 cup of the rice on top of the veggies and press down. Gather together the edges and corners of the wrap to cover the rice completely and twist to enclose the rice ball. Gently but firmly shape the rice into a smooth ball; be careful not to tear the wrap. It may also be shaped into a flat disc which is great for toasting. Proceed to make more rice muddhas as required. Serve right away or place all the muddhas in a container and chill until needed. Toasted muddhas: Unwrap the cold muddhas and toast on a seasoned cast iron griddle with a few drops of oil/ghee until golden brown on both sides. Plate and serve with chutneys, ketchup, pickles, etc; or, cool to room temperature and wrap them in cling wrap for safe transportation. Enjoy! !